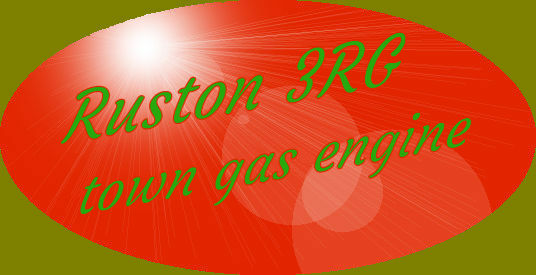 As quoted in ‘Ruston 7HRG’ I’ve now replaced that project with this new jobby, it’s quite a bit of an odd jobby as well. Although it’s a genuine engine from Ruston (No 124975) it seems like a bit of a cobble together of 1914 Hornsby petrol front end onto a 1920’s base. This is a town gas hit & miss engine which is quite unusual for a Ruston as well, by all accounts this appears to the only one in existence, Ray Hooley has supplied details of supply to Henry Page & Co,Ltd, Maltsters, High Street, Ware - via agents Bilbie, Hobson & Co, London on 06.12.1926. 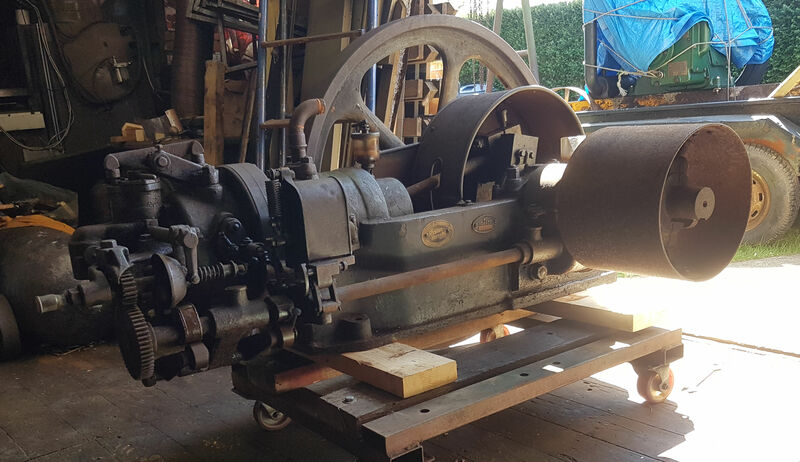 I’ve had some website issues so am only now updating so have gotten quite away into restoration, this engine was found buried in the barn of an old guy who died and his wife had it cleared out. A little hard now as have to look back and get all I’ve done into order, below are some images from initial strip down which I've labelled to give some explanation, click them for lager pic's. Just like to add that although this engine looked as though in it's rusted state things would be difficult to remove, this has turned out to be far from the truth as everything came undone easy (even tapered pins) and no fixings have been damaged at all over the years. First of all I built a trolley up to the stage of being able to build engine onto it as engine will become very heavy when back together. I purchased a old Parker Plant cement mixer trolley which is a nice old cast iron jobby which looks much more in keeping with age than subsequent later cheaper angle iron jobs. The wood is just kiln dried pine from my local Travis Perkins, distressed, stained and satin varnished. Here are some pictures documenting trolley build. Having made quite a progress with trolley I’ll now move onto covering the rebuild of engine onto it. Due to the fact that for quite awhile whilst rebuilding I had no access to update website you’ll probably see items in pictures that haven’t yet been added to early descriptions. I’m trying to set this documentation of the restoration into some understandable order. Here are some more pic’s which I’ve labelled as to what they are. The engine has quite a heavy air intake silencer and with the engine being on the move a lot (bumping along on a trailer) the air intake nozzle/valve could break off cylinder head particularly as its cast iron. I’ve provided a plate bolted to bottom of silencer and fitted tethers to trolley to stop it swinging. Also needing to keep most weight over none steered end of trolley (head end) so I’m mounting exhaust pot right next to head and had to make an elaborate frame to support pot (also a very heavy item). The side shaft to governor gear cover has been broken off many years ago and in the absence of a pattern to get one cast I made a cover from steel which I’ve taken to Watton foundry (East Coast Castings) to have a cast iron cover cast from that. Been reasonably busy! Getting through some important stages now and here are three of them. First is the Gear cover casting (in process of aging at moment), second is cooling tank mounting box which doubles as a tool box and third is tank and relative plumbing of, tank needs aging yet and pipes will be black. Project is nearly finished now and I’ve made a tug handle to move rig around (not that there will be much ‘tugging’ (it’s far too heavy)), made provisions to store on underside when not in use. As engine will have to be kept outside under a cover and the tug handle will be stored under the trolley frame, I've had the handle powder coated matt black. I'm quite away through designing and making folding frame that can be mounted on trolley , I'd like to have covered with .6mm aluminium sheet but would come to around 500 quid just in the sheet so going for having a waxed tarpaulin stitched to fit over, I will have to create a hump in top to avoid water laying up there. As I can’t keep this engine in my workshop I’ve been making a fully collapsible frame that mounts onto engine trolley, I’ve had a cover made by Cunningham Covers to fit over the top.